Armored kneeling archer, Qin dynasty (221–206 BCE). China. Terracotta. Terracotta Warriors and Horses Museum, Shaanxi. It’s hard not to give oneself over entirely to awe when regarding any of the great man-made wonders of the world. One wants to stare moist-eyed at these masterpieces and ponder the soaring ambition, ingenuity and perseverance of man, but there’s always that moment when the docent or catalogue informs you of the horrific human cost of the endeavor: slaves crushed under limestone blocks and blinded architects and the like. With the introduction of the unwelcome historical factoid, uttered apologetically or printed small in the footnotes, what should be monuments to man’s genius instead become ostentatious symbols of his cruelty. 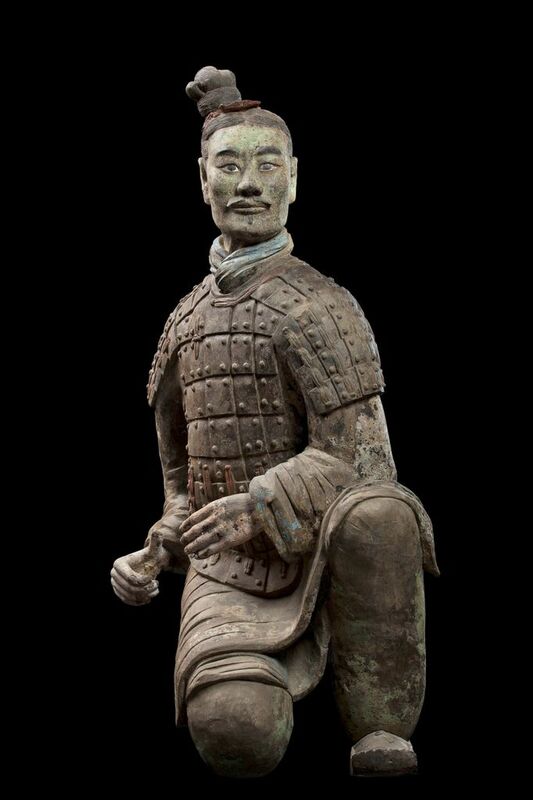 On display through May 27th at San Francisco’s Asian Art Museum is “China’s Terracotta Warriors: The First Emperor’s Legacy,” featuring ten of said warriors as well as 110 other objects from the burial sites surrounding First Emperor Qin Shihuang’s tomb completed around 208 B.C.. Merging seven states into the first incarnation of a unified China, the First Emperor (whom I’ll henceforth refer to by his name, Zheng, rather than his title) oversaw innovations in architecture, plumbing and irrigation, and the standardization of script, measurements and currency. He abolished the old hierarchical feudal system and instituted one of prefectures and counties answerable to and controlled by the central government — which led to what should be but isn’t one of the most infamous mass book-burnings in history. He initiated construction on the Great Wall of China, which can be seen from space but still wasn’t his most spectacular project. His chef d’oeuvre was his own underground burial complex, a 40-year vanity project the size of four football fields and for which he corralled over 700,00 workers and a vast amount of resources and wealth. This is not just a tomb — his tomb is there, but has not been opened — the complex includes a scale replica of his palace, stables (with bronze model and real, sacrificed horses), an armory, a zoo with more animals, rivers of Mercury modeled after the Yangtze and the Yellow rivers, entertainment parks with musicians and acrobats, additional burial pits and cemeteries, all rigged along the perimeter with auto-triggered crossbows and arrows to shoot potential graverobbers. Armoured General (detail), Qin dynasty (221-206 BCE). China. Terracotta. Excavated from Pit 1, Qin Shihuang tomb complex, 1980. Qin Shihuang Terracotta Warriors and Horses Museum, Shaanxi. The most dazzling excavation from the site, and the focus of this exhibit, is the terracotta army, 8,000 in number, and each slightly larger than lifescale and individually featured. Not one looks like another, either in physiognomy, costume or even coiffure. They represent a one-off burst of realism in Chinese art, unprecedented and thereafter discontinued (at least until the modern era). The fact that the museum can only present ten of them is unfortunate; undoubtedly much of their power lies in their great number. Examining photographs from the site invites one to imagine what it would be like to stumble in upon this vast, silent and fearsome crowd; it really is an army, and even without their original coloring, they are vividly lifelike. Whether standing with their weight seemingly centered on the balls of their feet, as if ready to sprint forward at any moment, or crouching with their (absent) arrows primed, there is a directness to their gaze that suggests their sculptors intended whoever beheld them to feel beheld by them as well. This makes sense, as the warriors had a more active purpose than simply to be admired; presumably anyone who made it past the rigged arrows and crossbows needed a good fright to deter them from the treasures within. Also, a king who believed immortality was achievable and that he had only to prepare for it, needed an armed guard in death as he did in life. 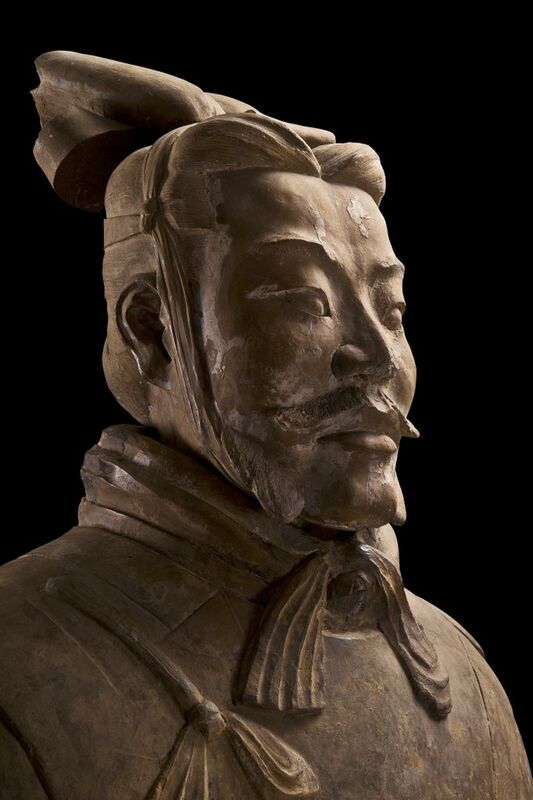 This entry was posted in ART, REVIEWS, San Francisco and tagged ART, Asian Art, Asian Art Museum, China, Chinese Art, REVIEWS, San Francisco, Terracotta Warriors. Bookmark the permalink.